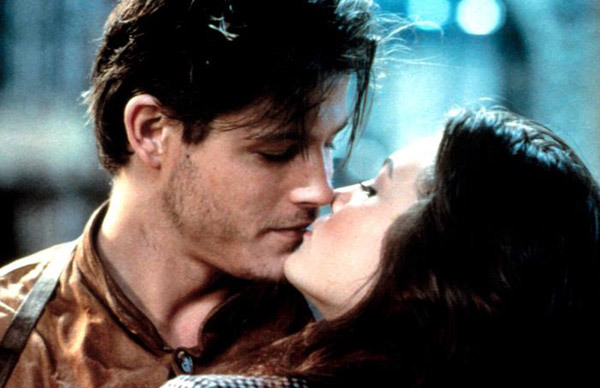 The title Streets of Fire comes from a Bruce Springsteen song on his 1978 album Darkness on the Edge of Town, and the movie shares his optimistic approach to the rock ‘n’ roll spirit. When Ellen Aims (Dianne Lane) takes the stage with her band the Attackers, she’s ready to take the crowd to the Promised Land. She might not share the Boss’ stage presence (or talent), but the over-the-top fire still sends the crowd into a frenzy. Tonight is what it means to be young for this excited crowd. Wearing a striking red dress, Aims has the right image and is primed to hit the big time. This show brings the star back to her old neighborhood for a triumphant return, but some hoodlums have other ideas. The nasty Raven (Willem Defoe) and his Bombers arrive on motorcycles and steal Ellen away. It’s up to her old flame Tom Cody (Michael Paré) to make a daring rescue and save the day. Streets of Fire is directed by Walter Hill, who also shot late ‘70s thrillers like The Warriors and The Driver. Labeled as a “rock ‘n’ roll fable”, it takes place in a fictional city where music is king. Along with the over-the-top rock of the Attackers, the performances include rockabilly and soul songs. The style is a cool mix of ‘50s rebels and the new wave look of the ‘80s. The villains might seem dangerous at first, but the story is fantasy and provides little menace. Defoe’s Raven talks a big game and deliver some brutish facial expressions, but he's no match for Tom’s skills. The major conflict involves Tom dealing with his feelings for Ellen, who obviously still loves him. Her goofy manager Billy Fish (Rick Moranis) is her boyfriend in title, though it’s obviously more of a business relationship. She only has eyes for Tom’s quiet, scruffy-faced loner. The love story is predictable and only works because Paré and Lane are convincing leads. They’re easy to watch on screen (particularly Lane) even as they go through the motions of a typical plot. The saving grace is Ry Cooder’s score, which adds much-needed energy and keeps us engaged. Combined with the lively performance sequences, the music supports the idea that we’re watching an imaginary tale dreamed up by a rock fan. Hill and Larry Gross’ screenplay never takes itself too seriously, even when Tom and Ellen are struggling with their demons. There are some missteps, particularly with a goofy fan (Elizabeth Dailey) who shows up near the end and adds little. The final battle between Tom and Raven is also a letdown, but it supports the fact that Hill’s not really interested in that conflict. The cast includes several well-known actors who went onto much bigger things. 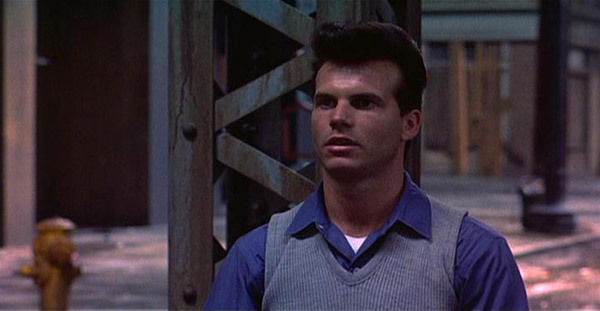 Bill Paxton makes a brief appearance as an oddball bartender at their local hangout. His hair is the true winner of his silly performance. Amy Madigan (Field of Dreams) plays McCoy, a tough character originally written as a man. She provides the back-up that Tom needs to rescue Ellen and is a reliable friend. McCoy's get to the point and doesn't avoid the issues like our quiet hero. You should also keep your eyes peeled for an early performance from Mykelti Williamson (Heat) as a back-up singer for the Sorels. That band performs "I Can Dream About You", a smooth tune that became a big hit for Dan Hartman. That song still gets random plays on stations today, and it's sadly the most recognizable legacy from this movie. In similar fashion to Purple Rain, Streets of Fire overcomes a generic plot with energetic songs and a fun tone. The acting here is miles beyond Prince and Apollonia's performances, but the solid music can't compare to the transcendence of "When Doves Cry", "Purple Rain", and other gems. This movie was designed to be the first entry in a trilogy, but it flopped at the box office and only earned back about a third of its $14 million budget. I'm curious about how Hill would have continued the story, and it's too bad that he never got that chance. This isn't an easy film to market because it doesn't fit neatly in a particular category. There are elements of an urban thriller, black comedy, and the concert film thrown into the mix. This combination of genres keeps the story from becoming predictable and makes for an entertaining 90 minutes. I thought I was king of 80s, but i haven't even heard of this film!! Scott, Defoe's hair (and his entire look) are ridiculous. I also hadn't heard of this movie until a few weeks ago, so I think it's been largely forgotten. It was pretty fun, though. Ha! Ruth, Mr. Paré makes a lot of brooding expressions like that photo in the movie. You'll get your money's worth with this one. And Dafoe is definitely in crazy mode. Thanks! I liked this movie quite a bit, from the music, to the deliberate mixing of decades with the clothes, microphones, cars, etc. I saw it back when it came out. It was the first thing I ever saw Defoe in. Chip, I also enjoyed the way that Hill mixed the styles of the various time periods in this movie. This was one of Defoe's first roles, so it's impressive to see him already displaying his ability to play an unhinged character. Thanks! Definitely a fun fascinating failure. Personally I think your article needs more pictures of Diane Lane, but that's just me. What? You're not charmed by the hunky Michael Pare? I do think that more Diane Lane pictures (especially from this film) would draw more page views of this one. I'm shooting myself in the foot! Richard, I'll definitely check it out and am interested in your thoughts on some of the other 1984 films. Thanks for the note on an older post!